to Google Maps for the United States, enabling users to more easily find their way when they’d like to take a two-wheeled alternative to walking, driving or public transit. Today we’re expanding biking directions to select regions in Canada: Ottawa, Toronto, Edmonton, Kelowna, Vancouver, Calgary, Winnipeg, Gatineau and Waterloo. Biking directions on Google Maps enables you to hop on your bike and get from point A to point B, whether you’re planning your daily commute, plotting out your weekend ride, or taking a lunch break. These biking directions easily integrate with all the other Google Maps features, so you can do a local business search to find a great new cafe, read reviews to help you decide if it’s right for you, get biking directions over to it, and pull up Street View to preview your route. We’ve factored in variables such as hills and bike lanes, and have color-coded roads based on their biking suitability. 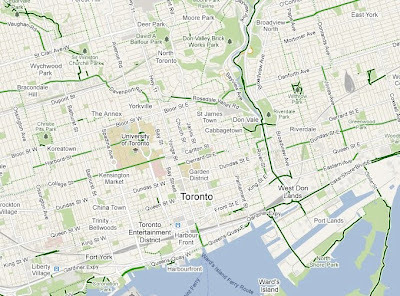 Dark green indicates a dedicated bike-only trail; lighter green indicates a dedicated bike lane along a road; and the dotted green line indicates roads that do not have bike lanes but tend to be suitable for biking. Just like with driving directions, you can drag the route to customize your trip. We’ve partnered with a number of Canadian cities, as well as the National Capital Commission, to provide this useful information to cyclists. Ottowa Mayor Larry O’Brien also shared his perspective at the recent Sustainable Mobility Summit. City planning agencies can learn more about opportunities to add their data to Google Maps by visiting to maps.google.com/content. 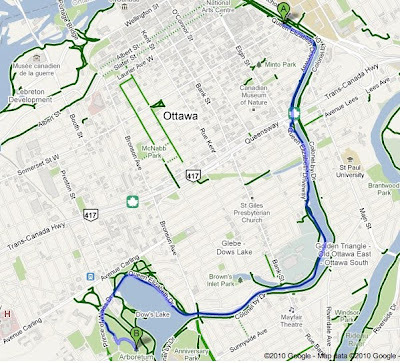 To get started finding biking directions in Canada, visit maps.google.ca/biking. We encourage all riders to help make our biking directions more complete by reporting any missing route information or problems via the “Report a Problem” tool. Earlier this year, we added biking directions to Google Maps for the United States, enabling users to more easily find their way when they’d like to take a two-wheeled alternative to walking, driving or public transit. Today we’re expanding biking directions to select regions in Canada: Ottawa, Toronto, Edmonton, Kelowna, Vancouver, Calgary, Winnipeg, Gatineau and Waterloo.